Is your latest notebook, tablet or smartphone equipped with a single USB-C port or thunderbolt 3 and you want to use common USB peripherals? Are you forced to constantly plug and unplug your favorite USB devices due to the lack of USB ports? 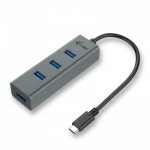 With this HUB you get another 4 standard USB 3.0 ports. Connect your external keyboard and mouse, transfer data or movies from a USB flash drive at speeds up to 5 Gbps or charge your mobile devices. This HUB does not require installation of drivers. You will just connect it by the USB-C cable and immediately you can start using it. This HUB has a built in overcurrent protection of your computer in case of short connection on the peripheries. The interface is compatible with USB 2.0. Thanks to its compact dimensions and low weight you can carry in your bag everywhere. HUB is suitable for use with Apple MacBook 2015, Chromebook Pixel 2015, Acer Switch Alpha 12, Dell XPS 13, HP EliteBook Folio G1 and other devices with the USB-C connector. The USB-C connector has many advantages, it is smaller, symmetrical and allows easy connection, because now you deed not take care of the rotation of the connector. More information about the USB-C is available here. In case of problems with the installation, technical difficulties or incorrect function of the equipment, check first for the possible solution in the FAQ tab.